The Select Mesh Faces commands help to edit existing meshes by selecting faces in the mesh object. Some STL/SLA printers have problems if meshes contain many long, thin facets. These facets can slow the printer down, produce odd results, or run the printer out of memory. The MeshRepair command may be useful when tuning up meshes for STL/SLA printing. The SelMeshFacesByArea command selects mesh faces from the parent mesh object that are within a specified range of area. Selects mesh faces with an area larger than the specified setting. Select a mesh face to set the area of the smallest face. Selects mesh faces with an area smaller than the specified setting. Select a mesh face to set the area of the largest face. Sets the amount the value is changed with each arrow click. Select an example mesh face to set the size range. A range of ±10% of the area of the selected face is used. The SelMeshFacesByAspectRatio command selects mesh faces from the parent mesh object that are greater than the specified aspect ratio limit. SelMeshFacesByAspectRatio selects mesh faces that are very long compared to their width. A ratio of 25:1 or above is considered long. In the image, the selected red faces have an aspect ratio of 9:1 or more. Set the target aspect ratio. Select a mesh face to specify the Aspect Ratio value. The SelMeshFacesByDraftAngle command selects mesh faces from the parent mesh object based on the angle of the faces to the view. 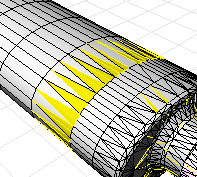 SelMeshFacesByDraftAngle can split a mesh object for molds or to look for undercut areas. In the example, the mesh faces were selected in the top view. Sets the starting angle from the direction of the viewport camera. Sets the ending angle from the direction of the viewport camera. The SelMeshFacesByEdgeLength command selects mesh faces from the parent mesh object that have an edge length greater or less than a specified value. The SelMeshFacesByEdgeLength command selects small or large mesh faces that do not belong in the mesh object. In the example image, the selected red faces have an edge length shorter than 0.1. Sets the mesh edge length to compare. Pick a mesh edge to specify the edge length you want. Selects mesh faces with an edge length shorter than the Edge length setting. Selects mesh faces with an edge length longer than the Edge length setting. The SelConnectedMeshFaces command selects mesh faces from the parent mesh object that are connected to a selected face. 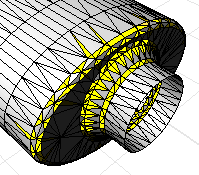 The SelConnectedMeshFaces command selects a set of mesh faces from a joined mesh object based on a specified break angle. This can be used to select a series of mesh faces that make up a planar surface in a mesh object or to select set of faces that make up a coherent feature in the mesh. Select mesh faces, and press Enter. Adjust options to get the selection you want. Sets the angle between mesh faces for selection. A setting of 0 will give you all the mesh faces that are connected and planar with the face you select. Sometimes planar meshes have a little noise in them, so a angle of 1 can help select planar faces. Select two mesh faces to specify the angle you want. Click to select a different mesh face. The SelMeshEdges command selects edges from the parent mesh determined by an angle between mesh face normals. The command may help if you have a mesh that came from a polysurface but no longer have the polysurface. 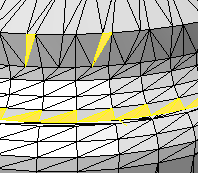 Using the command with the Unwelded option creates polyline approximations of where the edges of the polysurface were. Extracts edges with coincident vertices. The angle between the face normals of adjacent faces. Specify a minimum break angle. Specify an example edge to set the minimum break angle. Specify an example edge to set the maximum break angle. The SelMeshPart command selects all mesh faces radiating out from the selected face to naked or unwelded edges in the parent mesh object. Change which mesh faces are selected. 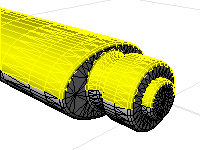 Makes polylines out of the edges of the selected mesh faces instead of extracting them from the parent mesh object. Makes a copy of the selected mesh faces rather than extracting them from the parent mesh object. Extracts the mesh face leaving a hole in the parent mesh object. Adds non-manifold edges (edges common to three or more faces) to the selection criteria.